Yes, Shingles is contagious. Read on to find more. The viral infection that leads to the development of the malady known as Shingles is an infection that affects the nerves that lie just below the skin . Shingles, also known as herpes zoster is a very painful disease that can have debilitating results, and in the US the disease affects at least one million people annually. The illness is known to occur among the immuno-compromised and the elderly with the greatest incidence occurring in patients over the age of 75. The period between infancy, childhood and adolescence is a very important period in the physiology of a person. It is during this crucial time that the body’s immune system is built up. Good nutrition, exercise and adequate rest all play a vital role in the growth of children into healthy adults. As part of childhood health care and to build immunity in the body, children receive several vaccines which help protect them from diseases such as polio and smallpox. What many people are not aware of is how these vaccines actually work. Most vaccines are weaker versions of the disease causing agents, which when injected into the body will cause the body to respond by producing antibodies to fight the apparent ‘infection’. In producing antibodies or other substances the body builds a natural immunity against that particular disease so the child will potentially never have to worry about getting the disease they have been immunised against. Most vaccines provide immunity against the disease for the person’s entire life, whilst some vaccines need to be taken again after a certain period of time. Shingles is not a disease prone or common to children, rather it is more commonly found in adults aged 65 years and older. The virus that causes Shingles is the varicella zoster virus which is the same virus that causes chicken pox . The characteristic features of shingles include swollen blisters that appear in one region of the body in a cluster. This disease is not one that is airborne so you will not contract Shingles by being in the presence of someone with it. From the time a patient starts developing symptoms to the time of clearance can be a matter of months or sometimes years. Recurrences of the disease in the same person are rare. The Varicella Zoster Virus is the main disease causing agent of this malady so this is not a genetic disease or one that is linked to heredity. This same virus is also responsible for causing chicken pox, a disease that is more commonly found amongst children and is identified by itchy blisters all over the body. When children are young they are required to have a series of vaccinations done to help them become immune to certain diseases. One of the vaccines that they receive is the weakened form of the Varicella Zoster Virus which induces a breakout of chicken pox in the child for a few weeks. After the chicken pox bout has finished the child now has immunity against chicken pox. However, this also means that within the child’s body remains the varicella virus. Now the virus is not completely done away with when the child heals from the chicken pox. This remaining virus lives in the body, as a suppressed agent, by the child’s immune system. The virus lives in the nerves of the body, particularly in the dorsal root ganglion. A normal healthy person who received this vaccine shot and thus has the varicella virus living in them, will be alright so long as they maintain a healthy lifestyle and their immune system is kept in check and working normally. Problems only start developing when the immune system becomes weakened or is comprised due to several factors such as the use of immune repressors, or perhaps the person is undergoing radiotherapy or is suffering from acquired immunodeficiency syndrome. All these weaken the immune system meaning that simple diseases that the body should be able to fight of, now it cannot and is in serious trouble. This is when the varicella virus takes advantage and resurfaces to do damage unchecked. Normally the body would be able to deal with a normal varicella growth, but now due to a compromised system the body cannot fight off the growing number of virus’ in the body. The virus has been living all along in the nerves, and so as it multiplies and grows unchecked, it causes pain in the nerves, and this is one of the characteristic early symptoms of Shingles. This is how Shingles develops in people. The early stage signs and symptoms of Shingles are so similar to those of several common diseases that it is vital to keep a careful watch over any unusual feelings and changes in the body, so that the disease can be detected early . The challenge that most physicians face is that of being able to properly and promptly diagnose and start the treatment of Shingles. Herpes zoster is hard to diagnose during the prodromal stage, this is the 48 to 72 hour period before the rash appears. At the start a patient may get headaches, and develop a fever, whilst having feelings of being ill at ease. These are all very common symptoms and can be misdiagnosed, so once again, a careful watch and monitoring of these symptoms is important. Localised pain that can be in the form of burning or sharp stabbings can be felt in certain parts of the body. Other people become increasingly overly sensitive. A numbness can also be felt, or a tingling sensation. Itching in the area that will develop the rash also begins round about this time. In children, the disease’s symptoms are often painless which makes it harder to diagnose a child and often leads to incorrect or misdiagnosis of the illness. By the third week an outbreak of rash is seen. This rash is uniquely found along one half of the body, and it is this sign that almost always confirms what the patient is suffering from. The rash is usually found on the torso or trunk of the body in bands or strands or clustered areas. However, these clustered bands of rash can also be seen on the face, neck, and sometimes even the eye area. The rash might be misdiagnosed as a case of hives as well, but the one defining factor about the rash is that it leads to changes in the skin. Some people are immune to the rash although they will exhibit the other symptoms of the disease such people are described as suffering from Zoster sine herpete which simply means zoster without the characteristic herpes rash. Because the zoster virus does not affect only one part of the body, but may affect different parts, the symptoms can also equally be as diverse. The virus’ main target area is the skin surface or the dermatone. Other people will experience the identifying rash around their eye area, nose and ears. In the later stages of the malady, the rash develops into small fluid filled blisters, accompanied by fever and continued feelings of being ill at ease. These fluid filled vesicles are extremely painful and will result in skin changes because they become filled with blood, changing colour. Within a week to ten days the blisters generally form a crust. This is a good sign because it shows that the skin is healing. However, some people are usually left with scars and skin pigmentation issues or discoloured patches of skin. When they talk about the contagiousness of a disease, health care workers are referring to the infectiousness or the ability for a disease to be transmitted from person to person either by direct or indirect contact. There are various ways in which diseases can be transmitted from person to person. There are diseases like the flu which are air borne and can be transmitted just by being in the same presence or room as someone with the illness and then there are some diseases which are water borne such as cholera, and further still, some which are sexually transmitted such as HIV. These three diseases do not look at whether you once suffered from the disease in the past or not, because everyone is at risk. With shingles however, the case is different. Shingles is neither airborne, nor water borne, nor sexually transmitted. 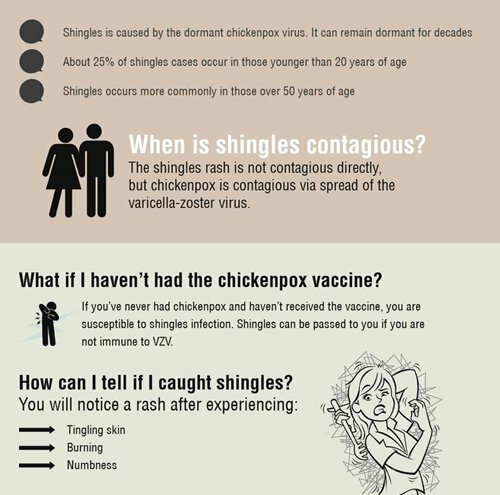 The varicella zoster virus that causes shingles may only be transferred when a person who has never had chicken pox comes into direct contact with the fluid coming out of the lesions or shingles blisters. The virus is carried in the fluid coming out of the open wounds. When the rash pustules break open and the liquid is exposed and someone touches it or comes into contact with it, this is when transmission of the virus can occur. This is the only way someone can ‘get’ the virus directly from someone else. And even then, the person will not suffer from shingles, but rather will develop chicken pox in the next few weeks . The Shingles virus can only be transmitted if someone is exposed to the virus directly during the phase when blisters begin to occur. This is the most contagious period. People who suffered from chicken pox when they were children already have the zoster virus in them, in an inactive form, so they really will not be affected even if they come into contact with the virus so long as their own immune systems are healthy and functioning normally. People with suppressed immune systems such as patients of HIV even if they had chicken pox in the past, should generally avoid people suffering from Shingles because exposure to any of the virus could have dire consequences upon their own health. Other people who should not come into contact with someone suffering from children include new born babies and pregnant women. Once the rash has broken out on the skin surface, the patient must make sure that they clean the affected area every day and bind and cover the area so that others are not at risk of contracting the virus. When the blisters begin developing a scab, then the contagious period is over and the risk of transmission is greatly reduced. How to prevent Shingles transmission? Do not touch or scratch the rash as the virus may be carried away with nails. Extra care needs to be taken to prevent the shingles from spreading, for instance by washing the hands properly after contacting the rashes. People with compromised immune systems. This includes people who are on immune-suppressive medications or people on corticosteroid therapy, those undergoing radiation therapy as in case of cancer patients, in recipients oforgan transplant, and people suffering from HIV or Human Immunodeficiency Virus infection. Premature children or infants with low birth weight. Thus it is important to administer varicella vaccine to prevent the susceptibility of contacting the infection from already infected individuals, especially in the contagious period. There are vaccines available that contains weakened varicella virus to invoke the immune response in healthy individuals that provides immunity in case of contact with the virus in future. These vaccines come in the name of Varivax and Zostavax in the market. If you do get Shingles, there are effective treatments available via antiviral medications. The diagnosis for Shingles can be complex if the early stage symptoms are incorrectly assessed. The most common way of coming to the conclusion that one is suffering from this illness is to wait for the appearance of the marked rash. Once this happen, and the rash is also noted to be appearing on one side of the body, then it is almost assured that it is a case of Shingles and effective treatment can begin. If the physician is unsure then smear samples are collected from the affected areas and sent to the laboratories for further testing. The general test for Shingles is known as the Tzanck smear and will be able to help the doctor make a final assessment and recommend a course of action. Diagnosis for Shingles can also be made more complex when the patient although exhibiting all the criteria of Shingles does not have the marked or identifying rash. In this case, then the only way to be certain would be to do a Tzanck smear to help clarify. Shingles is fortunately curable and not life threatening, although it can become quite debilitating in the first stages, and even later if not correctly and timely treated. The general course of the treatment is to try and reduce the pain that accompanies this illness, whilst decreasing the recovery time. If treatment is not started in time, then the disease can cause a painful condition known as postherpetic neuralgia, which is basically nerve tissue damage. The pain accompanying this condition wears of with time but can take a bit longer in older patients. This condition is more common in the elderly though, and is rare in people under the age of 50 who have a case of Shingles. Shingles even if left untreated will resolve itself over time, but due to the pain a course of over-the-counter painkillers are often prescribed by physicians, and some doctors often also prescribe several antiviral drugs such as valaciclovir and acyclovir. Shingles is not a life-threatening disease, but care still must be taken when in contact with people suffering from the illness . Taking care of your own health is one of the best ways to safeguard yourself from developing Shingles.